When most people think of musicals, they straightaway imagine classic, cult shows such as Grease or Hairspray, or really old-fashioned jazz dancing set in a 1920’s speakeasy. What they do not realise, however, is that although the concept of musicals has been around for a very long time, new musicals are constantly being developed in the present day and age. Hamilton is the latest “new musical” phenomenon, creating a hype similar to that of Les Miserables and Phantom Of The Opera back in the 1980’s. It has achieved tumultuous success captivating musical lovers on an international level, despite the fact, thus far, it has only been staged in Broadway and Chicago. 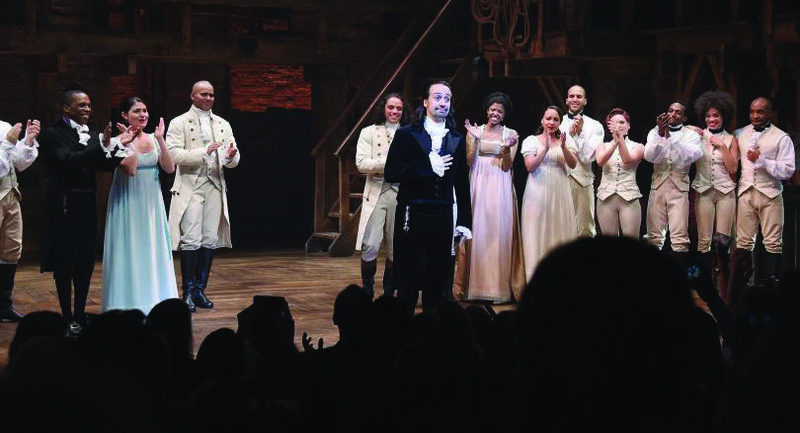 Having only debuted in February 2015, Hamilton is already breaking records, with an impressive 11 Tony Awards and a Pulitzer Prize for Drama under it’s belt. But what is it about this musical that is so enthralling for American audiences and musical fans worldwide? Hamilton tells the story of founding father Alexander Hamilton’s involvement with the foundation of America as well as the American Revolution through hip-hop music. Initially, this concept was preconceived as bizarre, but nearly two years since it’s debut it has quickly climbed up the ranks and has now certainly established itself as one of the most successful musicals the world has seen. This success is illustrated by both public demand – Hamilton is due to tour America and come to London’s West End in 2017 – and an array of aforementioned awards including “Best Musical” and “Best Original Score” at the 2016 Tony’s. The music, lyrics and story-line can all be accredited to the multi-talented Lin Manuel-Miranda, who also undertook the lead role of Alexander Hamilton on Broadway. The concept for the show emerged when Miranda read a biography about the founding father and felt inspired to transfer the story on to stage. Already a famous name in the world of musicals having composed the music and lyrics for In The Heights as well as being heavily involved with the stage version of Bring It On, it comes as no surprise that Miranda was able to succeed in creating a musical phenomenon. Many things set Hamilton apart from your everyday run-of-the-mill musical, the songs namely being one of these factors. There are no jazz hands to Bob Fosse-like numbers to be seen here as the songs are instead hip-hop infused with clever lyrics. The songbook is very unique – audiences would not expect to be told the history of America through upbeat and catchy hip-hop songs, but it works. Making history relevant through modern music was sheer brilliance on Miranda’s behalf. His choice in the musical’s distinctive tone certainly paid off as it is a massive factor contributing to the success of the show and it’s impact on the audience. Another reason as to why Hamilton has been such a success is due to its diversity amongst the cast members. A wide range of ethnicities are represented throughout the characters and chorus members, something that has been praised by fans and critics all over the world. This pride in diversity has been even more reinforced recently, regarding cast member’s Brandon V. Dixon’s passionate speech made at the curtain call the night new Vice President-elect Mike Pence attended the show. Dixon addressed Pence, who has been widely criticised for his beliefs, saying “we are men, women of different colours, creeds and orientations”, and that “we wanted to stand up and spread a message of love and of unity considering all the emotional outpour since the election”. This statement generated an incredibly positive response from the general public and portrayed just exactly why this show is so popular – it is all inclusive and appealing to everyone regardless of race, religion, gender or sexuality. Hamilton has achieved an extraordinary amount of success in a very short time, and it seems that the hype surrounding it is not dying down at all. Judging by the public’s reaction, this musical is definitely on course to leaving a long-lasting impact and creating a legacy for itself similar to the most successful musicals in the world: Les Miserables, Phantom Of The Opera and Miss Saigon. The fact that it will soon be staged on The West End is a testament to its popularity, and of course great news for European fans of the show. Prepare to hear a whole lot more about this musical phenomenon, because Hamilton is not bowing out of the world of theatre any time soon.